As mentioned yesterday I had a little project going last night and it was a success! I was so excited after work to go to The Container Store to check out their current sale that I forgot to take my fabric home that I was so stoked about. Ha ha! Anyway, mission accomplished. 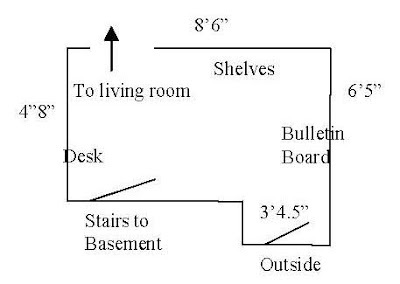 I took down my old coat rack in my entry way that was taking up an entire tiny wall and filled that wall with shelves. 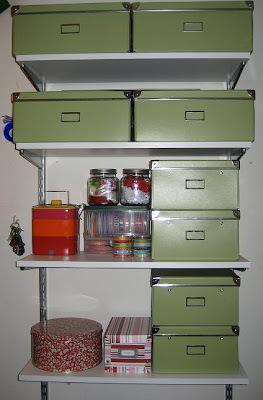 I got the elfa shelving which could not have been easier to install, I did it by myself! Wouldn't you know it, have way in to the project I realized, I forgot to take a before photo, but here is the after photo. My teeny tiny creative space is literally our entry way into our apartment. Not enough space to have large table or anything but I do have a nice space friendly desk where the top flips down. Below is the photo from the catalog, mine is a wreck right now. 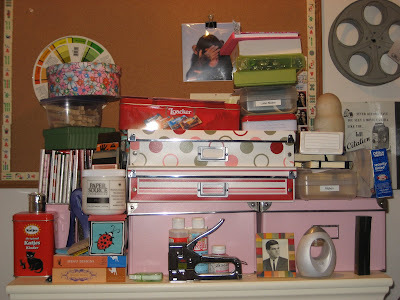 Tonight I am going to finish cleaning off the top of the desk which is currently the "leaning tower of craft supplies". I am going to sort through my scrapbook papers, yarn, fabric, notions and embroidery stuff and put it all in the green boxes (which are currently empty) and label them. 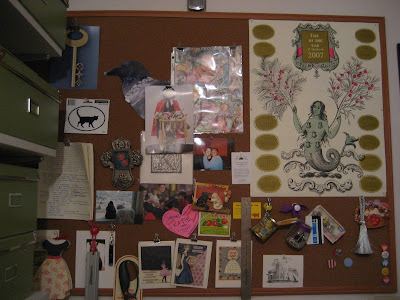 When I am done cleaning all of that out, I am going to rearrange my bulletin board. It is getting a little chaotic, which I like sometimes, but I think it could look better and actually be of use to me. I am thinking of pinning up some fabrics I am using for holiday gifts, etc. It needs help! found your blog thanks to marta's swap. i have a similar dream. 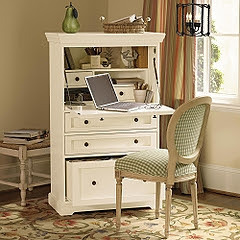 my craft room is home to everything else in my life as well: library, office, guest room, etc. i've been trying to do a little re-arranging as well. i love all the containers you got... they are great.